A KAIST research team has reported some of unique characteristics and driving forces behind submesoscale geophysical turbulence. Using big data analysis on ocean surface currents and chlorophyll concentrations observed using coastal radars and satellites has brought better understanding of oceanic processes in space and time scales of O(1) kilometer and O(1) hour. The outcomes of this work will lead to improved tracking of water-borne materials and performance in global and regional climate prediction models. In 2012, United States National Aeronautics and Space Administration (NASA) released a movie clip called “Perpetual Oceans”, which visualized ocean circulation obtained from satellite altimeter-derived sea surface height observations over two and a half years. When the movie was released to the public, it received a great deal of attention because the circulation patterns were strikingly similar to “The Starry Night” by Vincent van Gogh. “Perpetual Oceans” is full of vortical flow patterns describing the oceanic turbulent motions at mesoscale (a scale of 100 km or larger). Meanwhile, Professor Sung Yong Kim from the Department of Mechanical Engineering and his team focused on the study of the oceanic turbulence at sub-mesoscale (space and time scales of 1 to 100 km and hours). Sub-mesoscale processes are important because they contribute to the vertical transport of oceanic tracers, mass, buoyancy, and nutrients and rectify both the mixed layer structure and upper ocean stratification. These process studies have been primarily based on numerical simulations because traditional in situ ocean measurements can be limited in their capability to resolve the detailed horizontal and vertical structures of these processes. The team conducted big data analysis on hourly observations of one-year ocean surface current maps and five-year chlorophyll concentration maps, obtained from remote sensing instruments such as coastal high-frequency radars (HFRs) and geostationary ocean color imagery (GOCI) to examine the unique characteristics of oceanic submesoscale processes. The team analyzed the slope change of the wavenumber energy spectra of the observations in terms of season and sampling directions. Through the analysis, the team proved that energy cascade (a phenomenon in which large-scale energy transfers to small-scale energy or vice-versa during the turbulent energy transit) occurs in the spatial scale of 10 km in the forward and inverse directions. This is driven by baroclinic instability as opposed to the mesoscale eddy-driven frontogenesis at the O(100) km scale based on the observed regional submesoscale circulations. This work will contribute to the parameterization of physical phenomenon of sub-mesoscale in the field of global high-resolution modeling within ocean physics and atmospheric as well as climate change. Based on the understanding of the principle of sub-mesoscale surface circulation, practical applications can be further derived for radioactivity, oil spill recovery, and marine pollutant tracking. 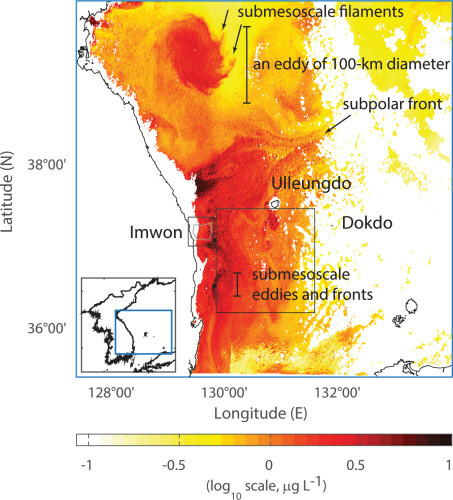 Moreover, the data used in this research was based on long-term observations on sub-mesoscale surface currents and concentrations of chlorophyll, which may reflect the submesoscale processes actively generated in the subpolar front off the east coast of Korea. Hence, this study can potentially be beneficial for integrated big data analyses using high-resolution coastal radar-derived surface currents and satellite-derived products and motivate interdisciplinary research between ocean physics and biology. Figure 1. 'The Starry Night' of Van Gogh and the 'Perpetual Ocean' created by NASA's Goddard Space Flight Center. Figure 2. 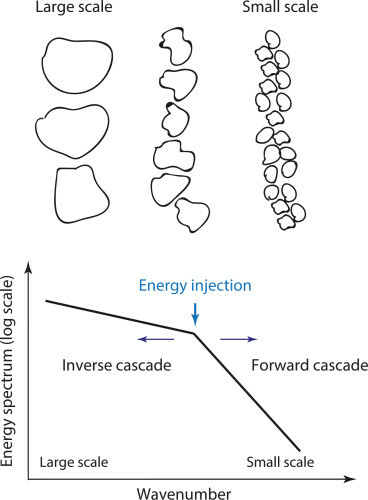 A schematic diagram of the energy cascades in forward and backward directions and the spatial scale where the energy is injected. Figure 3. A snapshot of the chlorophyll concentration map derived from geostationary ocean color imagery (GOCI) off the east coast of Korea presenting several examples of sub-mesoscale turbulent flows. Figure 4. 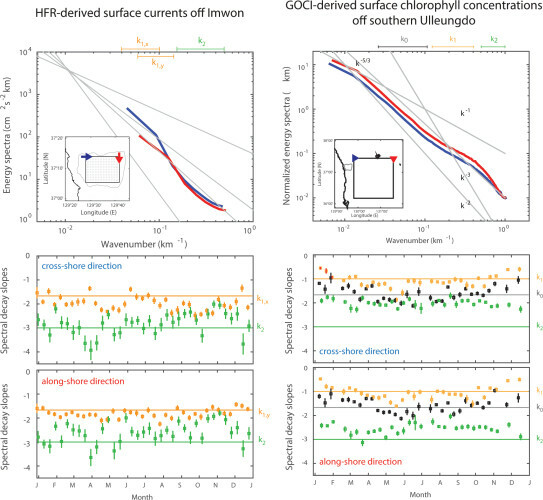 Energy spectra of the HFR-derived surface currents and GOCI-derived chlorophyll concentrations and the temporal variability of spectral decay slopes in the cross-shore and along-shore directions.